I recently hit a problem on my MacBook Air when trying to use Cisco WebEx. The Mac is running OS X 10.11 El Capitan. The WebEx client installed without an issue, but when I tried to join a meeting the connection would hang at 98%. I had to use Force Quit to kill the client. The solution to the problem was to change the proxy settings in Network Preferences. I’m not using a proxy but WebEx seems to have difficulties with the default setting. Open “System Preferences” then select the “Network” icon. Now select your current network connection from the left-hand panel (in my case this was Wi-Fi). Click the “Advanced…” button on the lower right of the panel. 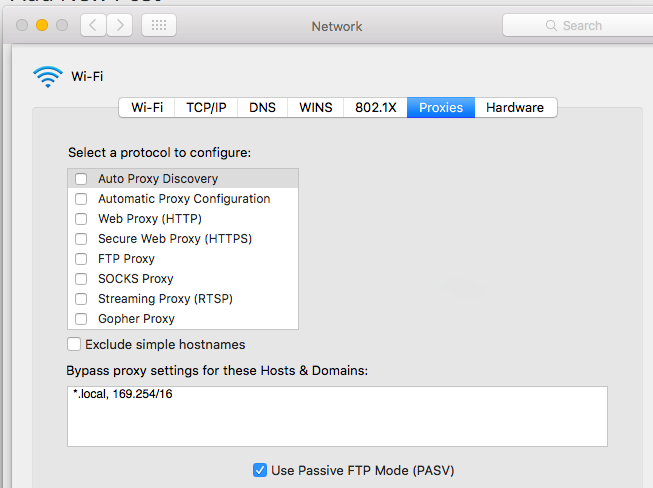 Click the “Proxies” tab and the proxy settings are on the left. I’m not using a proxy but the default setting is “Auto Proxy Discovery”. Untick that, click “OK” and then “Apply” and WebEx would connect without any further problem. 552 days, 15 hrs and 12 min.